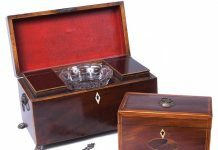 Do you sometimes hurriedly search for a hostess gift before leaving for a dinner party? When I receive an invitation, it’s usually accompanied by a request to bring tea to share with the guests. Because I am a tea blender, I would be disappointed if they didn’t ask for tea. Where I live, people tend to linger at the table while they enjoy lively conversation that continues long after the sun has set. The end of a beautiful meal affords the perfect opportunity to unveil tea’s unique charms before a new and receptive audience. Below I share my secrets to a memorable dinner finale. For the best effect, wait until the dessert course is finished, and then quietly set the stage for the tea’s arrival. Without calling attention to your actions, remove all dishes, eating utensils, and service plates so that nothing distracts from the ceremony about to unfold. And don’t even think of spoiling the mood by offering coffee! Place the teacups in the middle of each place mat, rather than at the right side, and in the same space the dessert plate recently occupied. 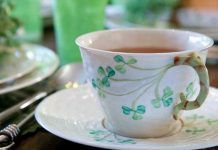 Put a small amount of dry tea in a plain or glass dish for guests to see and smell, and share a bit of information about the tea as they examine the leaves. This may be the first time some of them have seen tea outside a grocery-store tea bag. 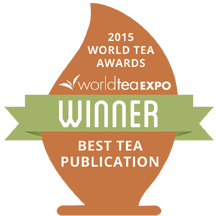 You might also share information about the best water temperature and steeping time for this particular tea. You don’t want the evening to end with a lecture, but be prepared for questions from your audience because they will undoubtedly be intrigued by this mysterious ceremony and will want to know more. At a late hour, a caffeine-free tea is usually preferred. 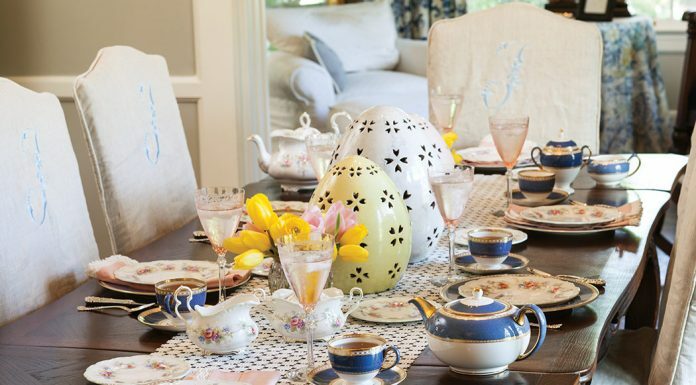 If the party is larger, give your guests the option of caffeinated or caffeine-free teas. Here are a few recommendations for leaving your guests with a sweet memory lingering on their delighted tongues. Ginger Orange Infusion—This blend of dried ginger, orange peel, and lemongrass is the perfect combination for settling the tummy and refreshing your palate. It’s hard to overbrew this infusion, and the aroma is so soothing. 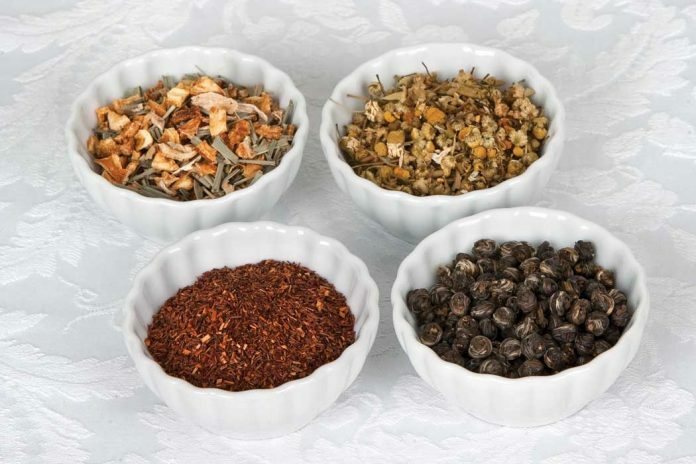 Don’t worry about caffeine because this blend contains no tea leaves. Rooibos—This popular herbal, made from the bark of a wild bush, is the national drink of South Africa. There, it is taken British style with a bit of milk or sugar, but Americans tend to like their rooibos flavored with herbs or fruits. Herbals—Peppermint and chamomile are two of the most popular herbals for nighttime consumption. You can make your tea course a bit more intriguing if you serve a French verveine (lemon verbena) or a Provence tilleul (from the flowers and leaves of the Linden tree). Jasmine Pearls—This is one of my dinner favorites because it adds a bit of theatre as diners watch the tiny pearls of green tea unfurl to reveal their two spring-picked leaves and a bud. The subtle jasmine aroma can be intoxicating for all the teetotalers at your dinner table. The simple addition of a final tea course will leave your guests feeling a bit more sophisticated and all the more thankful for your thoughtfulness. 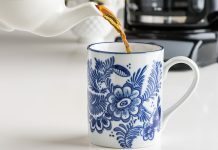 You can be confident in the adage that once the kettle is lit and the teacup is placed before your guests, the tea will work its centuries-old magic. Bruce Richardson wrote The Book of Tea (Benjamin Press 2011). Read his blog at theteamaestro.blogspot.com.